I lost count but I think Marilyn Maye sang about 50 different songs over her two sets Thursday night at the Dakota. That first set was well over 90 minutes and she took very brief pauses between tunes, just enough time to connect the song to its context and create audience anticipation. Just enough time to continue the thread of engagement with the crowd. Just enough time for a little banter with her beloved band. She sang tunes we all know like "Lush Life" but with hidden stories we may have never noticed. She sang songs from some of the most popular songwriters of the 20th century (like Johnny Mercer and Cole Porter) but she included gems that at least some of us were discovering for the first time (like Porter's "Looking at You"). She sang songs we seldom hear in a club setting ("Paradise Cafe") or not often enough ("Something Cool," "Here's to Life") or hardly ever because the lyric is so difficult to deliver ("Take Five," lyrics by Iola Brubeck). She sang her own parody, "Estherville," a sideways tribute to the winter landscape of the northwest Iowa town near one of her favorite venues, Lake Okoboji. She put together a medley of Cole Porter tunes that went to seven, not the usual two or three choices. Marilyn didn't merely sing with a voice as big as Ethel Merman (remember her?) but alternately tender and soaring as her story required. She didn't merely tell stories in song but seemed to rewrite each story along the way. And she sure didn't just stand there and sing. 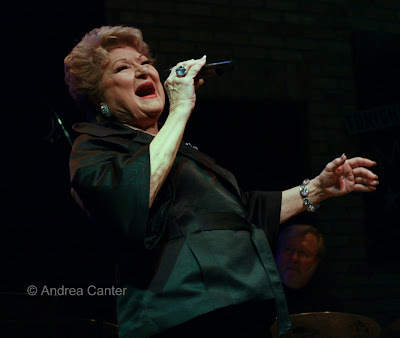 Marilyn Maye is one of the most physical singers to hit the Dakota stage. She sways, she kicks, she bends, she covers the expanse of the stage. And something magic happens, not just between the singer and the audience, but within the audience. Marilyn Maye is a portable generator, sending electric current that not only connects her to the crowd, but creates a camaraderie among strangers. We were all friends at a big party, enjoying vocal fireworks, all the time thinking "Here's to Life!" That Marilyn Maye will soon celebrate her 82nd birthday just made it all the more exhilerating. That she was still on key, kicking like a Rockette, and grinning ear to ear at the close of her fourth set over two nights made me wonder if I am but a couple decades away from finding that fountain of youth?